This Middle Eastern/oriental cafe takes entertainment very seriously. All national and international sport games are broadcast and backgammon and dominoes are available for additional fun. Bring friends, enjoy a great meal and some of the best shisha around. 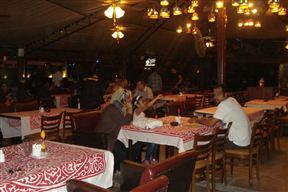 Kalvagy Cafe is 8.4km from the centre of Heliopolis , the nearest airport 2900.1km (Lokichoggio Airport).